One of the things they don’t warn you about in parenting class is that there is a lot to forget about the early years. Yes, there is a ton to remember, but there’s a great deal to forget – and most of it you want to remember. 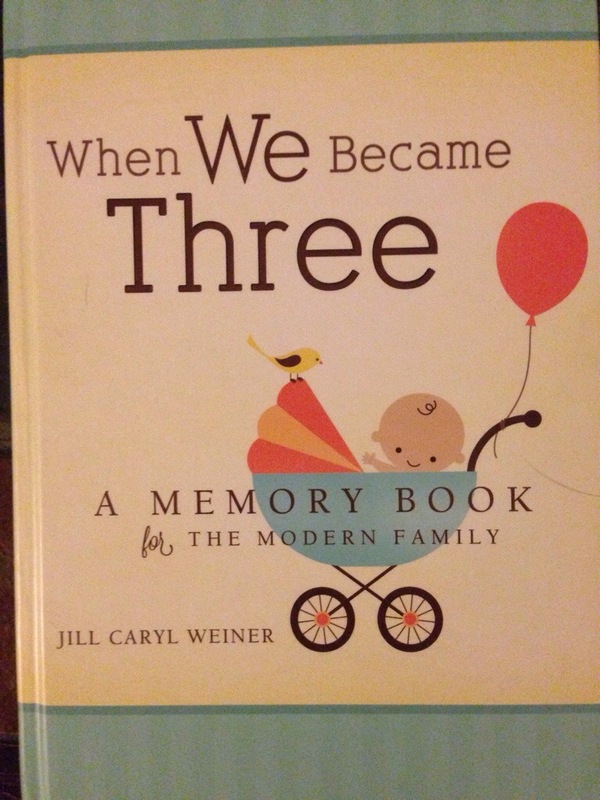 Hence, Jill Caryl Weiner’s book When We Became Three. If ever there was a book to facilitate the retellings of stories to children (or later at their wedding), this is it. This memory book takes you back before your “I Dos” and through the baby coochie coos. This is a good book to gift parents at a baby shower as there are a number of pages to fill in about them as a couple. Children love stories. And if you remember anything about your childhood, you probably remember the haze of information that you waded in to try and figure out exactly who you were. This includes information about our parents – how they met, what they were like before you. What you were like as a baby. What they were like when you were a baby. Your milestones. The highlights and, yes, even the lowlights because all of the stories remind you what you have accomplished and how all three of you have persevered. Our daughter is constantly asking us questions about how we met, what life was like before her, after her but before her brother was born, etc. there are some things that I, sadly, do not fully recall. Mind you, she has asked BOTH of us to tell stories about the early times, and that is another feature about When We Became Three– it’s not just about the mommy child experience. Dads are included as well! There are many questions about both parents to record and share. And as a dad, I appreciate that! So whether you are becoming a parent for the first time, or know someone who would appreciate a good memory book – you should definitely buy or gift When We Became Three. It’s a book that is sure to be pulled from your bookshelf many times – and may be a good source for blackmail when your kids get older. For more information about Jill Caryl Weiner and to purchase the book, check out this link. I received a copy of this book for the purpose of a review, but my thoughts and ideas are my own. Happy to be a part of the When We Became Three blog tour! This is the best idea ever and you’re right. We have forgotten so much about our lives prior to having children, I would love to capture all those memories to be told as stories to our children. It’s funny how stories pop up and remind us of the days of yore.